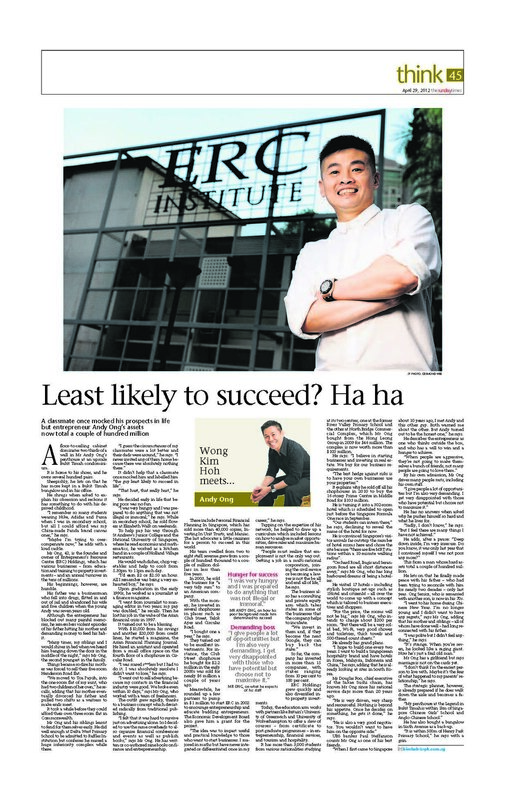 My Money Sense by Andy Ong: So much has happened over last few weeks! So much has happened over last few weeks! Hi Guys! My sincerest apologies for the lack of updates over the last few weeks ever since Asian Titan Trends. I have been absolutely hammered! My schedule has been so totally packed from dawn to dusk. I’m so glad to have my generals assisting me on a day to day basis. I’m trying to revamp our education offering amidst our jealous competitors questioning our value proposition. I’m trying to get our new hotel brand online and that is an absolute challenge! I am in the midst of arranging our Thai IPO. I’m looking at several property deals and I’m trying to keep my personal life in order with all the mess that’s happening as well. Arghh!!!! Absolutely challenging but interesting as well. The Sunday Times did a feature on me and the reporter is absolutely first class. He coaxed me into telling things that are extremely personal. After the article was out, I had a lot of you giving me encouragement which was very nice. Not everything can be measured in dollars and cents and having good friends is far more important than making that extra buck. The regards I received from all friends were absolutely priceless. The article also made me reflect on life and how temporal everything is. We need to count our blessings in the form of relationships and not worldly belongings! I will chat a little more with you regards the real estate market in the next couple of days. The Europeans are at it….. AGAIN!